Pfitzner Performance Gearboxes is working on a transmission upgrade for the R35 GT-R.
Pfitzner Performance Gearbox pride themselves on their design, research and development of custom built, high performance, close ratio gear sets, to the highest standard. The process of gear design is detailed, technical and precise, starting with CAD drawings developed in our state of the art “control room” using the latest software available. These blueprints ensure specifications including tooth count, desired gear ratio and basics like "internal gearbox dimensions", for your project are incorporated, to produce the strongest, lowest wearing and efficient, tooth profile. The custom tooth profile drawings are only the first stage of the process. 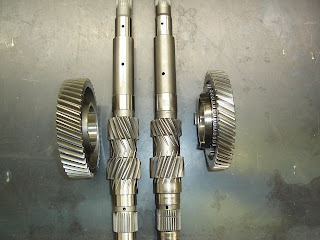 The next step in the production of a Pfitzner Performance Gearbox is creating unique tools to cut the gear set to exact design. These tools are high-tech, modern and of the highest quality to ensure each gear set is produced with ultimate precision. No information on a release date, or testing of this gearbox yet, but when we get some information we will pass it along.